In October and November 2018 our team visited eight faculties of University of Ljubljana – Faculty of Computer and Information Science, Faculty of Social Sciences, Faculty of Law, Faculty of Education, Faculty of Economics, Faculty of Arts, Veterinary Faculty and Biotechnical Faculty. The project started in 2010 when DIH`s campaign “Against Homophobia at the Universities” had been launched. 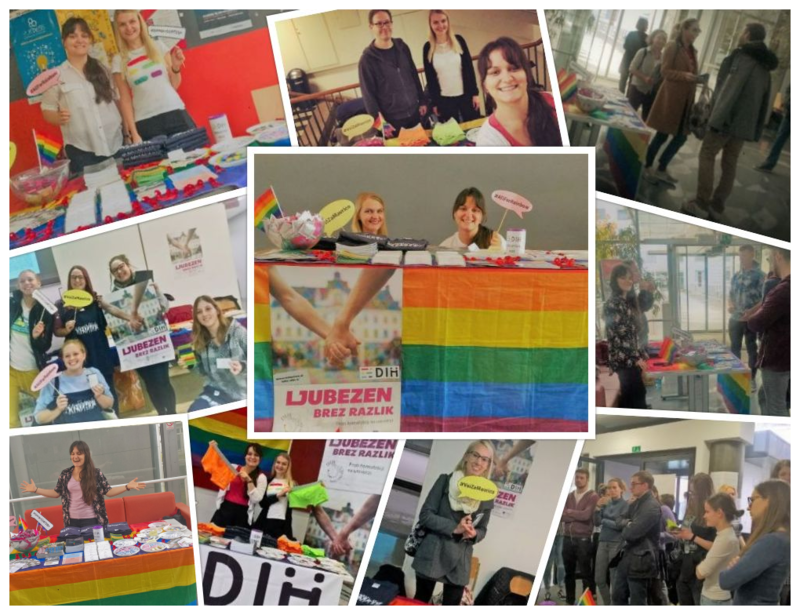 Since then students, lecturers and other faculty staff of the University of Ljubljana have been educated on homophobia, discrimination and the consequences of these through information materials. Every year we prepare a campaign poster and flyers, which we distribute or unveil at the faculties. At the information stands at faculties, we distribute promotional material, we conduct interviews and inform everyone interested in our campaign. We organize round tables or other forms of consultations, on which we additionally try to raise awareness about the violence that is being committed against LGBTIQ + individuals and its consequences. The project “Against Homophobia at the Universities” is supported by the Municipality of Ljubljana, ŠOU Ljubljana and FIHO. In the following we invite you to watch a video summarizing our activities at the different faculties of the University of Ljubljana. If you liked our video, give it a thumb up, subscribe to DIH`s youtube channel to stay tuned and comments down below, which faculties in Ljubljana or in other cities in Slovenia we should visit next time!